On Saturday I had the pleasure to meet a representative from Tea Forté for a demonstration tasting they were doing at Plum Market here in Ann Arbor. I was pretty excited when I heard they were coming, but ended up burning myself out that day since I drove to Ann Arbor for the tasting in the morning and needed to turn around drive straight home to take my mother to a play for her birthday in the afternoon. On Saturday, the Tea Forté rep, Ivy, was sampling their Skin Smart Lychee Coconut (which I’ve reviewed previously) and African Solstice rooibos. I was fascinated to find she was actually using a french press on the rooibos. When I asked her about it, she remarked that it’s great for demonstrations in that rooibos can sit longer in brew water and is cheaper to replace every so often as compared to other teas. Really I can’t fault that logic. I was impressed with the Lychee Coconut, having previously brewed it on my own with lesser results. Today I’ll be reviewing one of the teas from the Tea Forté sampler box she recommended: Blueberry Merlot (from the Herbal Retreat Organic Relaxation sampler box). Ingredients include: “organic rosehips, organic hibiscus, organic blueberries, organic sage, natural blueberry flavor, organic cornflower blossoms”. Provenance: Albania, Argentina and Chile. 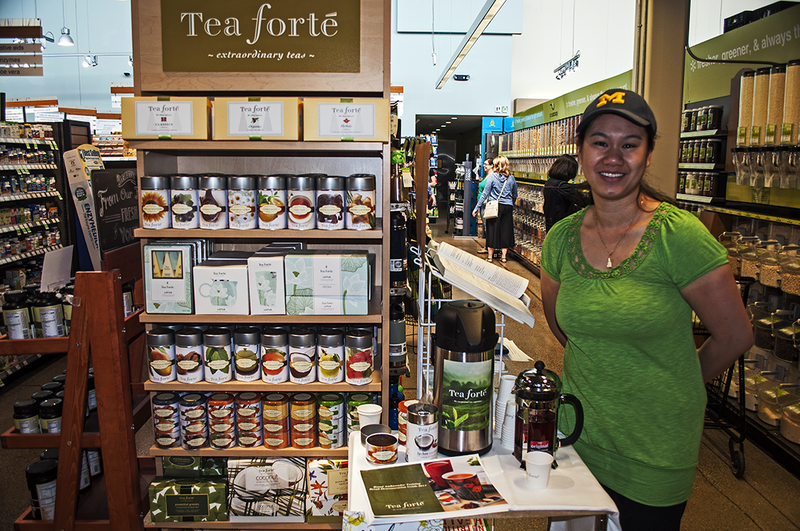 Tea Forté makes an effort (albeit a small one) in using over 20% fair trade certified ingredients, forks over the $10K/per tea for a USDA certification stamp and uses a CN-BIO-140 agro process. If I were to compare the two (and I’m not saying I necessarily would place them against the same fulcrum), I believe that so far Tea Forté is almost completely superior to TeaVana. Excursion: Tea Forté & Blueberry Merlot ~ plum market by Jocilyn Mors is licensed under a Creative Commons Attribution-ShareAlike 4.0 International License.